Apply cooking spray on a saucepan. Place the chicken in the saucepan and cook over medium-high heat for 8-10 minute and stir occasionally. Add the taco seasoning, beans, corn and water. Cook the mixture over medium-high heat for 8-10 minutes. Stir the mixture constantly until the sauce thickens a bit and reaches the desired consistency. You can use pinto beans (or any other bean) instead of black beans. Add a bit of fresh cilantro as garnish and to give it a touch of flavor. You can serve with tortillas. I love preparing recipes from different cultures for my family, especially when they're filled with flavor and help me save money and time in the kitchen. As a mother, I try to adhere to my food budget without sacrificing quality and taste. 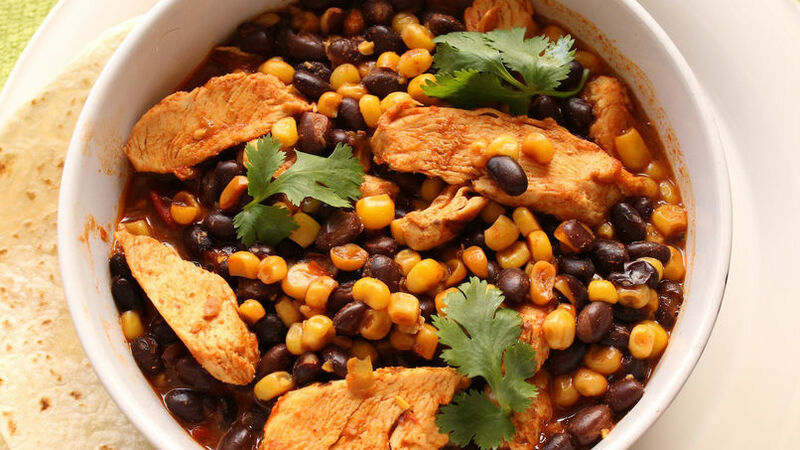 Whether you're trying to save money, time or just want to prepare an easy dish, this chicken and Mexican beans recipe is perfect for you. You only need 5 ingredients and a few minutes to create a delicious dinner. I hope you like it!